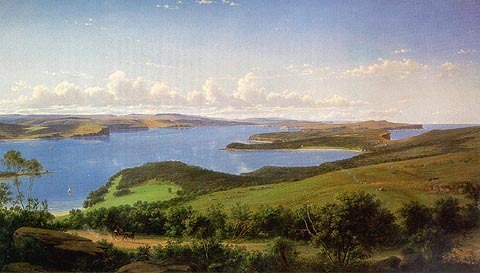 This is the largest of three known versions of this panoramic view of the Heads to Sydney Harbour. The other two works are held in the Art Gallery of New South Wales, and the National Gallery of Victoria. This work was commissioned by Thomas Budds Payne, and was probably developed from sketches produced by Eugene von Guerard during his only visit to Sydney in November 1859. A related pencil drawing by Eugene von Guerard, inscribed "The Sydney Heads', Monday 26 December 1859", is in the collection of the Dixson Galleries, Sydney. Also, "Sydney Heads, N.S.W. ", was reproduced as number 22 in Eugene von Guerard's book of 24 lithographs, published in 1866-67. This work was offered for sale through Christie's Australia. The Dallhold Collection. July 1992, Catalogue no. 20.